Pubs are my personal past imperfect, but they’re also redolent of the national nostalgia. Pubs are the votive archive of Englishness, with their feudal names of landed aristocracy and plodding occupations, their bosky and mawkish decoration — the fading pictures; the horse brasses; the engraved glass; the tack of defunct crafts suicidally hung from rafters; those greening photos of cricket teams and charabancs; darts trophies; the autistically blinking jukebox, with We Are the Champions and My Way; the witty mottoes; the damp beer mats and the smell of sour lees and urinal disinfectant. Pub is such a strong brand: so plainly and coarsely us. The boxed, yeasty essence of Blighty. They are the living rooms of the poor, the snugs for the lonely, the dispossessed, the nagged and cheated, and confessionals for the great, whingeing, halitosised British boor. Vanity Fair’s Christopher Hitchens takes a wry chisel to the Ten Commandments. Blurberati Blog » The Secret’s Out: PDF to Book is Here!. I’ve been a big fan of the Blurb internet publishing service for some time and have used it to produce several very professional-looking books for family and friends. The only drawback with Blurb in the past was that you had to use their proprietary software which, while free and easy to use, was a bit limiting design-wise. Now Blurb has announced a PDF-to-book service which allows you to design using programmes like Adobe InDesign using native file formats, giving you much more creative control over the end product. Awesome skiing: miles of really varied and challenging terrain (the new Revelation Bowl on a sunny day has to be experienced to be believed); fantastic instructors for kids and adults alike. Genial Aussie Howard Davis transformed my skiing in three days and had me flying down the slopes with more speed and panache than I thought possible. Women’s Week: The wife loved this – four days of seriously intense, extreme ski instruction, great camaeraderie, plus parties and dinners. Toss in all the store discounts and freebies and this proved to be one of skiing’s best-kept secrets. There are three a year, check them out at the resort website. No lines: No, really. Telluride is still remote enough not to attract the days crowds from Denver. We were there over President’s Day weekend and even at its busiest I don’t think we ever waited five minutes at the main lift. Free transport: No need to rent a car. The free Galloping Goose bus service runs around townevery 10-20 minutes depending on the time of day and gondolas up and across the resort are free too. The Boot Doctor: Magicians or technicians, we’re not sure but they made a world of difference to our feet. Great gear too. Telluride Truffles: Exquisite handmade chocs to die for. You’ll never eat Rocky Mountain Chocolate Factory again. Cool history: Butch Cassidy carried out his first bank robbery here in 1889. And it was the first city in the world to have electric street lamps thanks to the world’s first AC power plant, built to serve a mining industry that by the end of the 19th century had clawed a staggering $360 million worth of gold from them thar hills. The Telluride Historical Museum is a little gem worth visiting. 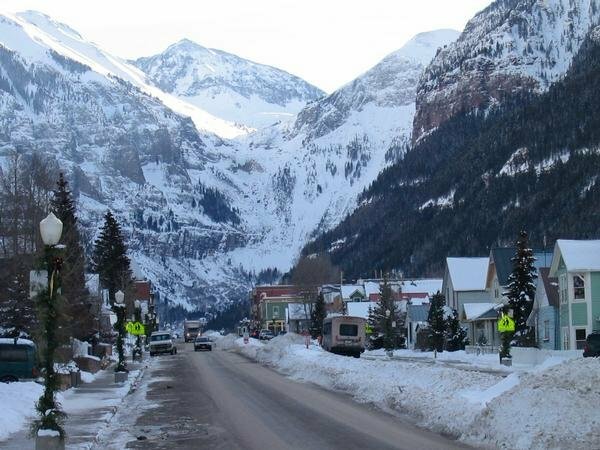 Snow mobiling: The boys at Telluride Snowmobiling Adventures took us on an spectacular two-hour tour up to the deserted old mining town of Atta. Western gear: I don’t know what it is about the west that gets under a man’s skin but this is the place to get kitted out like an extra from True Grit. I stopped after stocking up on leather and horsehair belts, a rancher’s palm hat (perfect nape-to-nose coverage for a Bermuda summer) and ranch-hand jeans that claimed to be “cowboy tested”. Not on Brokeback Mountain, I hope. Then again, Telluride is hosting Gay Ski Week the week after we left. Would have just loved to have seen the RuPaul Drag Race, darling. Hair today, gone March 20. It’s all coming off on March 20 – my hair and handsome beard, that is! The hair-raising venture in aid of children’s cancer charity St. Baldrick’s. I’ll be part of Team Gibbons (wife Tracey and son Toby are going under the razor too). You can pledge your support using your credit card (or someone else’s) online at my St. Baldrick’s page. And don’t forget to swing by BAA on March 20 to see the Balding of Breezeblog live! Thanks also to Sirkka at the Bermuda Sun for running this piece on our efforts. As of today (Feb 11) we have raised $5,900, well on our way to our $10,000 target!! If, like me, you want to try and understand what’s going wrong with the financial markets but are confused by credit default swaps and your eyes glaze over at the mention of securitised debt obligations, then I heartily recommend this piece by British historian in Vanity Fair. Extraordinary events explained in plain English.